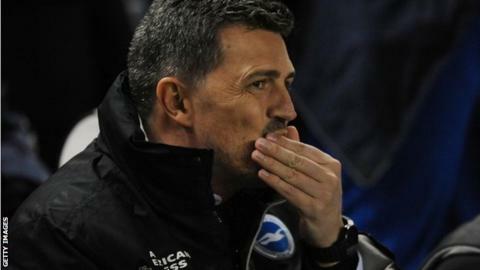 Brighton moved to within three points of the play-off positions after coming from behind twice to end a three-match losing streak with a draw at Blackburn. David Rodriguez put the visitors ahead from inside the area early on before Jordan Rhodes levelled from close range. Tom Cairney put the hosts ahead from a tight angle before Gordon Greer levelled from six yards. A Rhodes penalty restored Rovers' lead but Dale Stephens's header equalised. Brighton had lost their last three matches without scoring but Stephens's late equaliser moves them to within three points of sixth-placed Reading. Blackburn have only won one of their last seven matches and are now seven points away from Reading. The hosts started slowly and Brighton took the lead when Rodriguez latched onto Jesse Lingard's through ball to finish. Gary Bowyer's men hit back though and Rhodes scored when he diverted in Tom Cairney's free-kick. Cairney, returning from injury, then finished well from an acute angle after good approach play by Tommy Spurr. Rovers were on top after the break but, following a host of missed chances, Greer fired home Kazenga Lua Lua's cross to level. Rhodes's 50th goal for the club came from the penalty spot, after Grant Hanley was fouled, but Stephens headed home Lingard's cross to equalise. Blackburn boss Gary Bowyer: "We're on the receiving end of it tonight. In the last two games it's been us scoring late on, but I think that's the least we deserved. "Brighton only had four shots on target. I'm majorly disappointed because the first goal we scored was an outstanding finish, second goal was an unbelievable move and third goal was a penalty. "And then you look at the goals we've conceded, I'm majorly disappointed. We've kept 12 clean sheets this season and we have to get back to that quickly because we're scoring goals." Brighton assistant head coach Nathan Jones: "This was the least effective we've been in terms of possession and control of the game and ironically enough we scored more goals than we have in the previous three but that's football. "Nowadays if you're four points off it, it takes two results and two games. Now it's one game to get us back in it and that's a positive really." Match ends, Blackburn Rovers 3, Brighton and Hove Albion 3. Second Half ends, Blackburn Rovers 3, Brighton and Hove Albion 3. Attempt missed. Rudy Gestede (Blackburn Rovers) header from the centre of the box misses to the right. Assisted by Craig Conway with a cross following a corner. Corner, Blackburn Rovers. Conceded by Matthew Upson. Attempt missed. Solly March (Brighton and Hove Albion) left footed shot from outside the box misses to the right. Assisted by Jesse Lingard. Matthew Upson (Brighton and Hove Albion) wins a free kick in the defensive half. Foul by Rudy Gestede (Blackburn Rovers). Substitution, Blackburn Rovers. Rudy Gestede replaces Lee Williamson. Goal! Blackburn Rovers 3, Brighton and Hove Albion 3. Dale Stephens (Brighton and Hove Albion) header from the centre of the box to the top right corner. Assisted by Jesse Lingard with a cross. Goal! Blackburn Rovers 3, Brighton and Hove Albion 2. Jordan Rhodes (Blackburn Rovers) converts the penalty with a right footed shot to the bottom left corner. Penalty conceded by Gordon Greer (Brighton and Hove Albion) after a foul in the penalty area. Penalty Blackburn Rovers. Jordan Rhodes draws a foul in the penalty area. Corner, Blackburn Rovers. Conceded by Keith Andrews. Jordan Rhodes (Blackburn Rovers) wins a free kick on the left wing. Goal! Blackburn Rovers 2, Brighton and Hove Albion 2. Gordon Greer (Brighton and Hove Albion) right footed shot from the left side of the six yard box to the bottom left corner. Assisted by Kazenga Lua Lua with a cross following a corner. Corner, Brighton and Hove Albion. Conceded by Matthew Kilgallon. Attempt saved. Solly March (Brighton and Hove Albion) left footed shot from outside the box is saved in the centre of the goal. Assisted by Stephen Ward with a cross. Substitution, Brighton and Hove Albion. Kazenga Lua Lua replaces David Rodríguez. Jesse Lingard (Brighton and Hove Albion) wins a free kick on the left wing. Joshua King (Blackburn Rovers) wins a free kick in the defensive half. Substitution, Blackburn Rovers. Joshua King replaces David Dunn. Solly March (Brighton and Hove Albion) is shown the yellow card for a bad foul. Craig Conway (Blackburn Rovers) wins a free kick on the right wing. Attempt missed. Leonardo Ulloa (Brighton and Hove Albion) header from the centre of the box misses to the right. Assisted by Solly March with a cross following a corner. Substitution, Blackburn Rovers. Chris Taylor replaces Corry Evans because of an injury. Corner, Brighton and Hove Albion. Conceded by Grant Hanley. Attempt saved. Tom Cairney (Blackburn Rovers) left footed shot from outside the box is saved in the top right corner. Assisted by Jordan Rhodes. Michael Keane (Blackburn Rovers) wins a free kick in the defensive half.